A 30-year-old pedestrian has died after being struck by a lorry on the M6 this morning. The collision happened at around 3am on Thursday (February 14) on the southbound carriageway in Staffordshire. 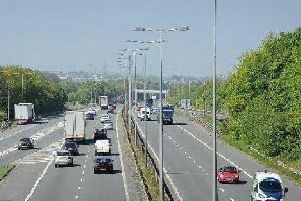 A 30-year-old pedestrian has died after being struck by a lorry on the M6 in Staffordshire this morning. The M6 remains closed after seven hours between junctions 14 (Stafford North) and 13 (Stafford South). A diversion is currently in place, with all three emergency services at the scene and several miles of queuing traffic - with police saying the road was likely to remain closed for several more hours. A spokesman for Staffordshire Police said: "Police were called to reports of a collision between a lorry and a pedestrian on the M6 Southbound between junction 14 and junction 13. "Emergency services have attended and sadly a 30-year-old man has died at the scene. "Next of kin have been informed and specialist officers are supporting the man’s family. "The M6 remains closed and is expected to be closed for the next few hours." Anyone with information or dashcam footage is being asked to call police on 101 quoting incident number 52 of February 14.